Maine is often considered remote to many tourists due to its far northeast position in the US, but once in the Pine Tree State, Maine promises lots to do and a great rugged outdoors to explore. Outdoor activity is a year-round affair offering visitors opportunity to hike, camp, go boating and explore countless trails. With over 3,500 miles (5,600 km) of coastline and 6,000 lakes to enjoy, Maine is the perfect place to unwind and take in some fresh air. The Acadia National Park includes 60 square miles (155 sq km) of the robust and remarkable coastline drawing in close to four million visitors each year to tour its landscape and observe some incredible wildlife. 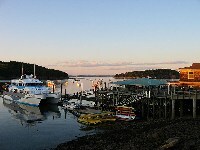 Not far from the Acadia National Park is the village of Bay Harbour. Whether it's the museums of the Bay, the gorgeous restaurants and bars, or the whale watching, there is loads to keep visitors occupied and entertained. For lovers of history, Maine has a rich history in the fields of shipbuilding, whaling and of course the Revolutionary War, offering historical sites to visit statewide. There are also lots of memorable galleries and museums to explore in the downtown Arts District for those with artistic interest and flair. This beautiful and one of a kind state is a wonderful place to visit any time of year, offering charm, history, art and the best of the great outdoors!